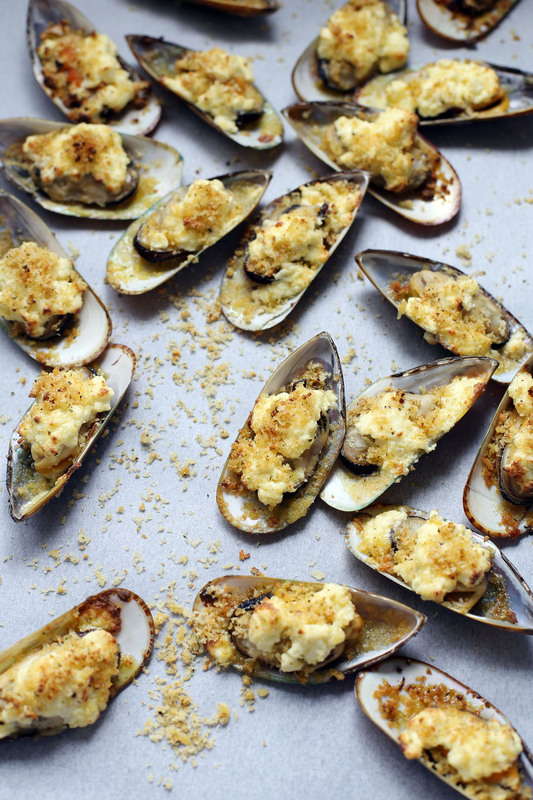 Baked Tahong or Baked Mussels is a very simple appetizer or cocktail dish that is made out of baked mussels and cheese. A popular hit in Philippine celebrations such as birthdays, fiestas and even family gathering as it is really easy to prepare, it is inexpensive (depends on where you are) and the visual presentation is stunning. Traditionally this is prepared with lots of butter and cheese baked together with lots of bread crumbs, I find that to be a bit overpowering in taste and it masks the true flavour of mussels, so in this recipe we will be using the same ingredients but as a complement to the flavours, we will also pan fry the bread crumbs to give it a crunchy texture. So here is my improved version of the Filipino classic. Place mussels in a pan; add ¼ cup water then cook over medium heat covered, once all shells are opened remove from pan then drain. Once cooled down remove the top shell and place on a baking tray. In a pan add butter and melt in medium heat, add garlic and sauté in low heat until it turns golden brown. Add the bread crumbs and continuously stir until crunchy. Add chopped parsley then stir for 1 more minute. Remove bread crumb mixture then set aside. Mix together parmesan cheese and Colby. 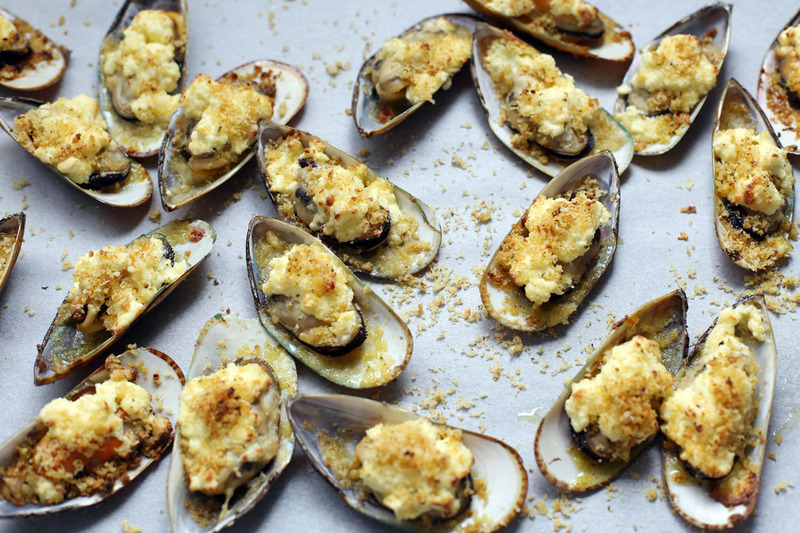 Place a teaspoon of breadcrumbs on each mussel then top it with a tsp of cheese mix. Set oven to grill setting at 180C then grill mussels for 10 minutes or until cheese melts. Season with freshly ground black pepper then serve. Another seducing dish! I would be very happy to have it for lunch today! I would love so much to taste green mussels, but they don’t exist here (only the smaller, black ones). Same as me I wanna try the black ones, I haven’t tried it yet. Those look amazing! I like your idea of not masking the flavor of the mussels, well done. Oh, that’s an awesome one! These looks amazing!! So chic and stylish.., love it thanks for sharing. Also thanks so much for stopping by at my blog, I really appreciate all the kind words. Mussels are one of my favorites and these look fantastic. I especially appreciate that you’re retaining some of mussel taste in the dish. Great job! I love baked mussels and here in NZ they are so cheap to buy, or if you live by the beach like I do you can pick your own at low tide off the rocks! I never think of baking them though so will try that next time. Lovely and very appetizing but I have never cooked mussels before, maybe its time to try out soon, got some idea from your recipe though. Your photo looks so crisp too! This one is a fave here in the house. Daughter loves to do this though her recipe misses the bread crumbs. Will ask her to include them next time. I think it gives the crunchy goodness in the baked mussels. Btw, can you send some of your harvested mussels here in the Phils when summer comes? haha.. How I envy you! Has anyone tried this with panko crumbs?